The largest public science festival in the Fraser Valley and KPU Langley’s largest event attracting over 1,000 visitors in 2016, Science Rendezvous offers free hands-on activities, shows, tours and displays for the entire family. Visitors can get their blood pressure checked by KPU nursing students, make a seed bomb launched in the air with a catapult, take a polygraph test, and watch the crowd-favourite Chemistry Magic Show. There will also be tours and free tastings in KPU’s custom-built beer brewing lab for adults 19 years and older. Science World will be onsite judging the KEVA bridge Spam challenge in which competitors using wooden blocks must build a bridge strong enough to support as many tins of Spam as possible. All visitors will have the chance to win a one-year family membership to Science World and day passes. More than 30 scientists from KPU as well as Bricks 4 Kidz, Mad Science, Mathnasium, Science & Nature Co., and many others will also be at the event to provide demonstrations, talks, and assist visitors with experiments and games. For more information about Science Rendezvous at KPU and for free tickets, visit kpu.ca/sciencerendezvous. 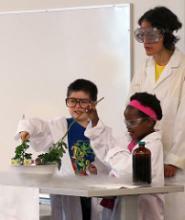 For photos of Science Rendezvous from previous years, visit Flickr.